As sometimes happens, a lot more often than it used to I must admit, time gets away from us and we find ourselves with a hungry family and no time for an elaborate or time consuming meal. You all know how I like to spend hours getting dinner ready, right? But now that I'm back on the rat treadmill that kind of time is becoming harder to come by and I wind up looking around for something quick, nutritious yet still fabulous! With my picky family (you have no idea how discriminating they are...) whatever I serve has to be A+ even if it's a simple provincial Mexican meal.... just because it's rustic and humble does not mean it can't be amazing, right? So I strive to maintain the WOW factor along with economy and practicality for every day meals. Boring is not in my repertoire nor is "that again?" type of dishes, so I do lots of homework and pay attention to how to cut recipes down to their simplest form while still insuring that the "essence" and flavor of the original remain, after all, if it isn't fabulous it's not worth eating..... Plus, my guys are the allergic type so I must watch out for chemicals and preservatives that can cause problems too, so fresh ingredients are a must. Here are some tried-and-true ideas you can adapt or adopt that will serve you well. So what if they might be considered "breakfast offerings", there's no rules in the kitchen- you'll see how well they come to the rescue and give you a lovely evening meal or midnight snack. Here we go! If making rice: Rinse rice in a large fine-mesh sieve under cold running water, then drain well, tapping sieve. Combine rice, 1 1/4 cups water, and 1/4 tsp salt in a heavy saucepan and bring to a boil. Reduce heat to low and cook, covered, 15 min. Remove from heat and let stand, covered, 10 min. If using leftover rice then proceed with the rest of the recipe. While rice is standing. Stir rice from bottom to top. Lightly butter a 1-cup measure. Firmly pack enough rice in measure with a rubber spatula to fill measure halfway. (If spatula becomes sticky, dip in water.) Invert measure onto a buttered plate, then tap measure to unmold rice. Repeat with remaining rice, rebuttering measure each time, to make 4 cakes total. Chill disks, uncovered, at least 15 min. Heat 1 tbl butter in a nonstick skillet over moderately low heat until foam subsides. Add rice cakes and cook, rotating each for even browning, until undersides are pale golden, about 8 to 10 min, then turn cakes over and add 1/2 tbl butter to skillet, swirling to melt butter. Cook, rotating each cake once, until golden, about 5 min more, and transfer to plates. Increase heat to high, add 1/2 tbl butter to skillet, then brown bacon (or meat), turning over once, about 2 min total. Place 2 slices bacon on each rice cake. Wipe out skillet with a paper towel and heat remaining tbl butter over moderately high heat until foam subsides. Crack eggs one by one into skillet. Sprinkle with salt and pepper and fry until whites are cooked and yolks begin to set. Place 1 egg on each rice cake stack and sprinkle with scallion. Notes: Rice cakes can be shaped 1 day ahead and chilled, loosely covered after 15 min. Any type meat (or leftover cold cuts) can be used too and the eggs don't have to be fried either. Also, if you have any sauce or salsa you like, you can top with this and add cheese, etc. Deep Fried Poached Eggs with Serrano Ham and Creamed Veggies.- Change Eggs Florentine into something crunchy and delicious! You'll love this! Whisk together cream and 2 tsp flour in a small bowl until just combined. Cook shallot in butter in a heavy skillet over moderately low heat, stirring occasionally, until shallot is softened, about 3 min. Add spinach, nutmeg, salt, and pepper and cook, stirring constantly, until excess liquid is evaporated, about 2 min. Stir cream mixture, then add to spinach and cook, stirring occasionally, until cream is slightly thickened, about 2 min. Remove from heat. Stir together bread crumbs, salt and pepper in a shallow bowl. Spread remaining 1/2 cup flour on a plate and set aside for dredging. Gently blot any water from top of poached eggs with paper towels, then sprinkle with salt and pepper. Carefully dredge 1 poached egg in flour, dusting off excess. Transfer to beaten egg, spooning to coat completely, then transfer with a slotted spoon to bread crumbs, letting excess egg drip off. Coat with crumbs and transfer to a plate. Repeat with remaining poached eggs, 1 at a time. Cut sliced ham crosswise into 1/4-inch-wide strips. Heat 1 1/2 inches oil in a heavy saucepan (about 1 1/2 inches deep) over high heat until deep-fat thermometer registers 375°F. Fry ham in oil, stirring occasionally with a clean slotted spoon to separate strips, until crisp, 15 to 20 seconds. Transfer ham to paper towels to drain. Return frying oil to 375°F. Lower 2 eggs (1 at a time on slotted spoon) into hot oil and fry until golden brown, 15 to 20 seconds. Transfer fried eggs to paper towels to drain. Repeat with remaining 2 eggs. Reheat spinach over low heat, stirring constantly and adding more cream or water to loosen mixture if necessary, about 1 min. Divide creamed spinach among 4 plates, then top with poached eggs and ham. Note: You can use chard, Kale or whatever you like for the veggie; poach the eggs in advance and keep in the fridge to save time and makes them easier to handle too; doesn't have to be ham, any meat could do as long as cut fine, think of other possibilities too. Artichoke Pancakes with Goat Cheese.- Wonderful..... we love them! Imagine the flavors! Fill a large bowl with ice water. If using fresh artichokes: To prepare artichoke bottoms, slice off the stems of the artichokes and remove any tough outer leaves. Place them in a large non-aluminum pot and cover them with cold water. Squeeze the lemons into the pot, add the juice and the lemon halves to the pot, and bring to a boil over high heat. Reduce the heat to a medium and cook until the artichokes are tender, about 25 min. Use the tines of a fork to check for tenderness. Place the artichokes in the ice water. When they are cool enough to handle, drain and remove the leaves and the fuzzy chokes. Trim off the edges of the bottoms. Preheat the oven to 350 degrees. Place the artichoke bottoms, eggs, and water in a blender or a food processor fitted with a steel blade and blend until creamy. Pour into a mixing bowl, add the flour, salt, and pepper, and combine until the mixture forms a thick paste. Whip the egg whites in a steel bowl until they hold stiff peaks. Gently fold into the artichoke mixture.Place a cast-iron skillet over medium-high heat and when it is hot, add the oil. Drop dollops of batter (about 2 tbl per pancake), a few at a time, into the hot oil. When the edges begin to stiffen, turn the pancakes over and cook until lightly golden, abut 2 min. Place the pancakes on an oven proof plate. Combine the goat cheese and sour cream in a small mixing bowl. Top each pancake with a large dollop of the goat cheese mixture and place in the oven until the cheese just begins to melt, about 2 min. Left over mashed potatoes? Make Hash Browns instead!.... Can't beat them for taste and texture! Beat the egg in a small bowl. In a medium bowl, mix together egg and onion with mashed potatoes. Add salt and pepper as you desire. At a medium setting, heat olive oil in a medium size frying pan. Scoop the potato mixutre into the frying pan in 4 inch circles, pat with a spatula to flatten the mounds to approximately 1/2 to 1 inch thick. Cook until bottom is browned. Flip the patty over and brown the other side. 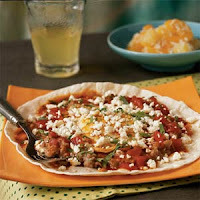 Huevos Rancheros.- One of my favorites and if you have any leftover salsa in the fridge, only takes a moment. If you have salsa leftover, add a little water and heat up in a pan until bubbly and turn off heat. Heat the beans and meat, if using. Reserve. If not then in a frypan, put 1 tbl oil and heat, add the garlic & onion and stir for 1-2 min. Add the tomato, peppers and stir. Add the chicken stock and bring to a boil, lower heat and simmer until it all comes together and then add salt & pepper and taste to adjust seasonings. Reserve. In a pan with a little oil in it, fry the tortillas so they become soft yet don't let them harden. Put 1 or 2 tortillas in each plate. Spread beans on each tortilla lightly and then put the meat on top of this (if using). Add a little more oil to the pan and put 2 eggs and fry to your taste. When they are cooked, put them on top of the meat or tortillas. Go ahead and get all the plates to this point, when they are ready, add the cilantro to the sauce and divide among the plates by topping the eggs with the salsa. Grate the cheese on top of all, a dollop of crema or sour cream and sprinkle with more cilantro. Serve. Note: These can be done with any type of sauce: green, red, mole, etc. and you could even use bottled (Eek!) sauce too.